WORCESTER, MA -- Three world records and one national record went down at the 2018 NELMSC and Colonies Zone SCM Championships, held December 8-10 at Worcester Polytechnic Institute. New Englander Fritz Bedford of the UV Rays shaved 0.10 off the world record in the men's 55-59 50-meter backstroke in 27.86. Drew Modrov (CHEL) took .77 off the men's 25-29 400-meter freestyle record with his time of 3:52.83 and Erika Braun (NCMS) bettered her own women's 45-49 100-meter freestyle record of 58.21 with a 57.89. Steve Hiltabiddle (1776) set the national record in the men's 50- 54 50-meter butterfly, taking it from 25.98 to 25.60. In individual scoring, Dan Rogacki (NEM-PITY) scored 215 points to win the men's high point award, while Mindy Williams (NEM-GSP) and Ann Louise Onton (CONN) tied for the women's title with 209 points. Kysa Crusco (NEM-GSP) picked up 196 points to take third on the women's side and Mark Keil (NEM-MAMA) and Modrov rounded out the men's podium with 177 and 170 points, respectively. 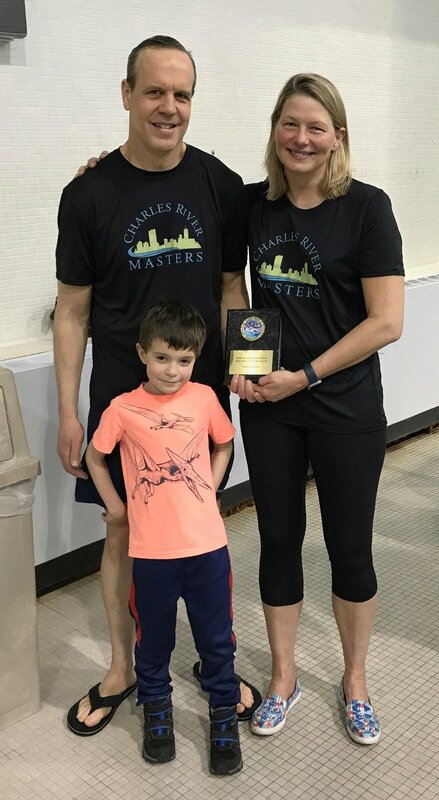 In the team competition, Charles River Masters beat host Worcester Area Masters and 2017 champ Connecticut Masters in large team scoring, 3340 to 3094 to 2682. In the medium team division, Great Bay Masters (1767 points) beat out Granite State Penguins (1674) for first, while Maine Masters (1385) narrowly defeated SwimRI (1378) for third place. Visiting teams UMAC Terrapin Masters (845), Chelsea Piers Fitness (661), and Landshark Masters (621) turned in strong showings in the small team division. Sarasota YMCA Sharks (290), North Carolina Masters (255), and Nutmeg Masters (246) were tops in the Squad division. Leaf Peepers is a meet where world-record setters and USMS first timers hang out together on deck and in the pool. Fritz Bedford (top left) set one world and one national record in the men’s 55-59 age group. UVRay Susan Reid helps swimmers decide which item to take from the renowned awards table filled with amazing baked goods. 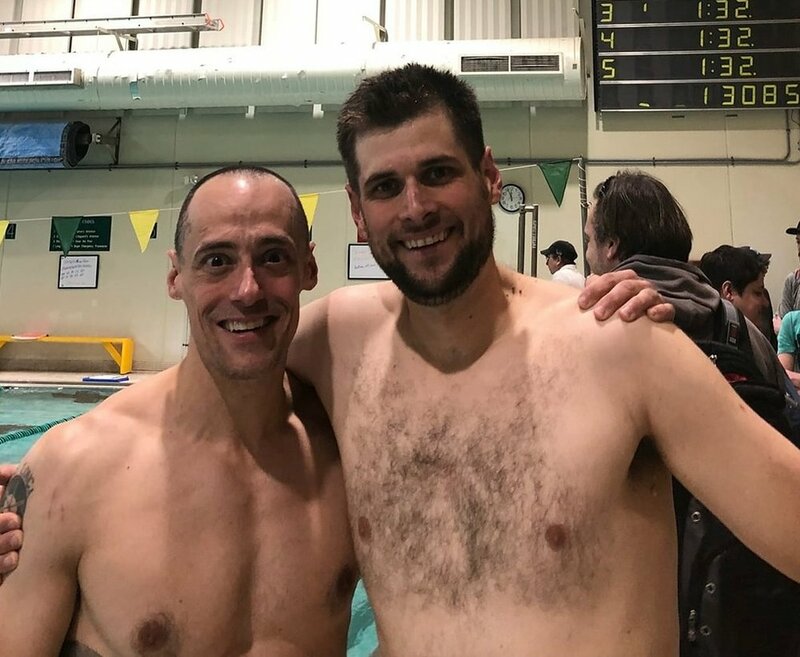 WHITE RIVER JUNCTION, VT – Fritz Bedford set his ninth lifetime Masters World Record on October 20, 2018 at the 10th Annual Leaf Peepers Masters Mini Meet at the Upper Valley Aquatic Center (UVAC). During the meet, the 55-year-old Bedford, a member of the UVRays masters team, launched three attacks on the record book. In his first event, Bedford’s 28.16 in the 50-meter backstroke was half a second off the world record of 27.62, but good enough for a new NELMSC record. In the 50 butterfly, Bedford had more success. His 26.55 set a new national record in the men’s 55-59 age group and was one-tenth of a second shy of the world record. Finally, in his third event, Bedford blasted a 1:00.78 in the 100 backstroke, clipping six one-hundredths of a second off the previous world record. Arnold Meardon, the meet’s most senior swimmer, set two NELMSC records. In addition to Fritz’s three records, which were automatic NELMSC records, two other swimmers set regional marks. Arnold Meardon of the UVRays set two NELMSC records in the men’s 85-89 age group: 50 fly (1:07.26) and 100 IM (2:28.79). David Vail of Maine Masters set three NELMSC records in the men’s 75-79 division: 50 back (40.88); 100 back (1:29.55); and 200 back (3:20.07). 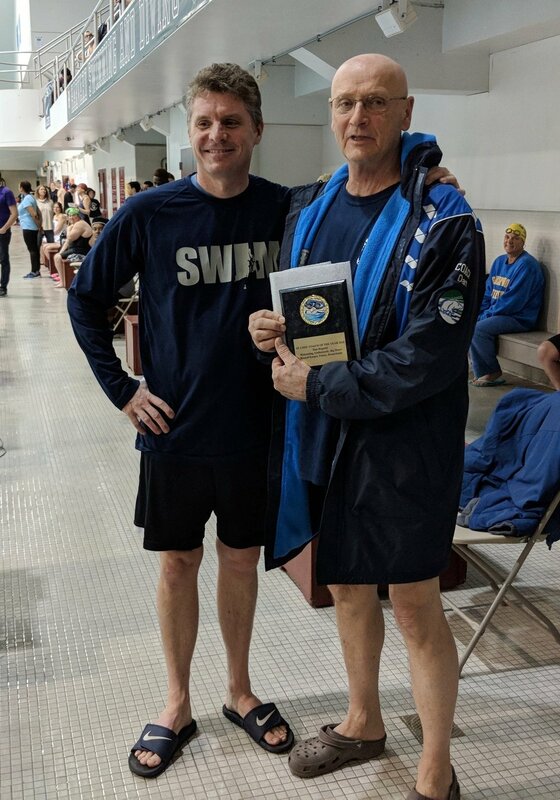 UVRay Jim Larrick (men’s 35-39) took home “Fastest Man in the Pool” honors with a meet record 12.11 in the 25 freestyle. Swimmers decide who will take which leg on the Icebreaker Relay. This year’s Icebreaker Relay shuffled 24 swimmers into four random teams, where everyone had to quickly become friends and choose their best relay lineup. Relay legs included kicking with a pumpkin, swimming with apples, howling at the moon, and partnered swimming with a noodle. Mary Gentry is everyone’s FAVORITE meet director. 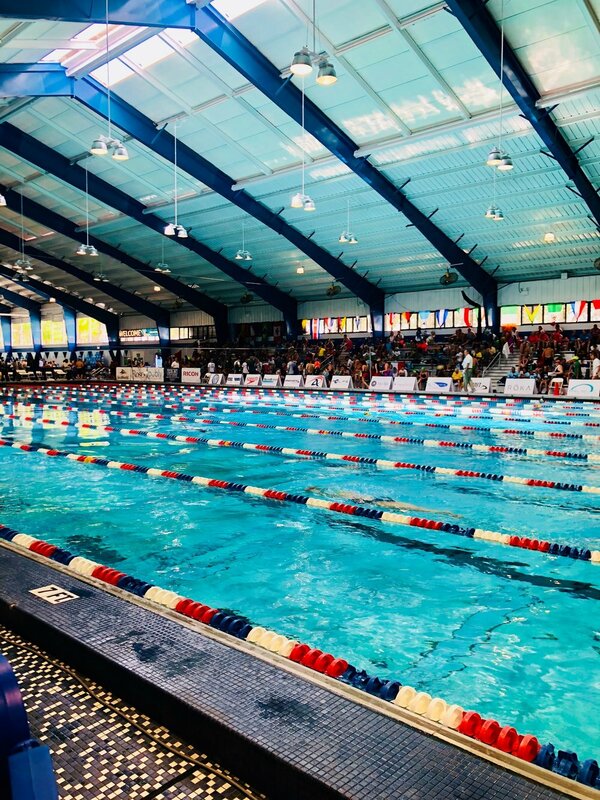 ORLANDO, FL -- The 2018 Union Americana de Natacion (UANA) Pan American Masters Championships were held from July 25 to August 8 at the YMCA Aquatic Center in Orlando, Florida. More than 2,200 athletes participated across five disciplines -- swimming, diving, synchronized swimming, water polo, and open water swimming -- making it the largest UANA Pan American Masters Championships ever held. Over 1,700 pool swimmers hailed from 30 swimming federations (most from North and South America) and broke 65 FINA world records, 136 UANA records, and 38 USMS national records in long-course meters events. New England swimming legend Fred Schlicher, who recently turned 70, set world records in the 200 free and 200 fly. He also set UANA records in the 50 back and 200 back. Two weeks earlier, at the 2018 South Central Zone LCM Championship meet in Texas, Fred bested the world record in the 100 fly, as well and set national records in the 200 IM and 400 IM. Congratulations Fred. You are an inspiration to all masters swimmers! New Englanders who attended reported that the meet was friendly and very well-run even though the hot, humid weather made for a challenging meet environment. With events spread over seven days and no New England relays able to be formed, there was a shortage of team camaraderie. Marian Coakley (NEM), 81, who describes herself as a "very young 80 year old," was pleasantly surprised with her 3rd, 4th and 5th place finishes usually in a group of eight. This was Marian's first meet in several years because of a couple of hip replacements. Marian goes to the pool every day of the year - but for an hour of power water walking (for rehab), not swimming. She decided to go to the meet because it was close to where she now lives in Florida. "People were really friendly, and I was glad to be a part of it." If all goes well, Marian plans to attend both Spring and Summer USMS Nationals in 2019. It is great to be back "in the swim again." Harvey Ottinger (NEM-BASS), 61, had just returned to competitive swimming after a 40-year layoff. Harvey swam the 50, 100 and 200 breaststroke, placing 7th in the 50 and 100 and 8th in the 200 while improving on all of his seed times by a good amount. Harvey commented that, "Orlando was great and the venue was very nice. Hotels were abundant and very reasonable. Food was everywhere and fun. Everyone was treated very well, and I made many new friends. Quite honestly, I had a complete blast." Crusco, Mareb, and Estel sporting some serious hardware! 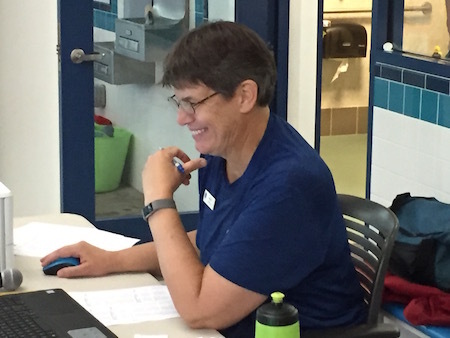 Beth Estel (NEM-GSP), 62, had a great meet including setting new UANA records in the 50 and 100 breast. "I was very happy with my results," said Beth. "My breaststroke friends aged up and showed up, so that made it challenging and exciting, even one from the UK. Peggy McDonnell, another breaststroker - not competing - came to cheer me on. Beth did comment on the lack of team camaraderie from New England during the day, however, felt she had great quality times with her swim buds (Karen Mareb, Ildi Szekely, and Kysa Crusco and family), in the evening, going out to dinner and sightseeing, including a dinner at Disney, and at a Greek restaurant where Karen danced with the belly dancer. Maria Stotts (NEM), 36, swam three pool events plus the 1.5k open water race in Daytona Beach. This was her first international meet ever, and also her first time in Florida. She found the meet very organized, and enjoyed meeting participants from around the world. The aquatic center was located in an area with plenty of things to do nearby - restaurants, shops, aquarium, wax museum, giant observation wheel and a 450-foot swing ride. She enjoyed the trip very much and hopes to go to either Mesa, Arizona or Mission Viejo, California next year for Spring and Summer Nationals. Dave Bright (NEM), 65, competed in his second Pan Am Masters meet after attending the one in Sarasota four years ago. "Orlando may not have been my first choice for a location. It was hot and humid, and there were lots of tourists and traffic gridlock, but it had what we needed for the meet, and I thought things went well. One of the things that happens in these big meets is that we tend to get to the pool, warm-up, swim our race and then leave. Sticking around to watch your teammates may mean a 4-hour wait in the bleachers. So, there is not as much team unity as we see at a regional or national meets. Personally, I felt the absence of having access to any 50-meter pools to train in here in Maine." Dave swam four events - one per day and then came back home at the halfway point of the meet. He was very happy with his finishes - 3rd in the 800 free, 2nd in the 400 IM, 3rd in the 200 back, and 7th in the 100 back. Both the 200 back and 400 IM were New England records! Hopefully some will hold up for US & FINA Top Tens. CONGRATULATIONS to all swimmers from New England. Mark your calendars for the the next Pan American Masters Championship meet, to be held in Medellin, Colombia in Summer 2020. The Colombian Swimming Federation will host this meet at the Atanasio Girardot Sports Complex, a world class aquatics facility with two long-course competition pools and six warm-up/warm-down pools. The open water event is tentatively scheduled be held in Guatupe, a wonderful small town north of Medellin. Going forward, UANA will host the Pan American Masters Championships on even-numbered years and FINA will host the World Masters Swimming Championships on odd-numbered years. DOVER, NH -- On July 15, 77 swimmers from across New England gathered at the Jenny Thompson Pool to compete in the 2018 Summer JT LCM Mini-Meet. Granite State Penguins took home the team title with 649 points, followed by Maine Masters (587) and New England Masters (561). Twenty-two teams attended the meet. Douglas Sayles (SWMR), Lauren Heath (GBM), and Robert Duguay (CONN) won five events each to tie for the top individual prize with 100 points. Conversing with the late Frank Wuest could fill you with enough encouragement, love, and support to take on the world. This March, don your Speedo in his memory by partaking in the New England LMSC Short Course Yards Championship DISTANCE DAY CHALLENGE on Saturday, March 10th at Harvard's Blodgett Pool. By negative splitting your 1000 or 1650-yard freestyle event you will honor Frank's memory and his widow Lyn Duncan will make a donation to the Cole Jensen Horne Special Needs Trust, set up for Frank's nephew. Cole is living with autism and has a beautiful perspective on life, which you can read about here. But be forewarned, his smile is contagious! Frank loved all things swimming and was committed to increasing participation in this amazing sport. 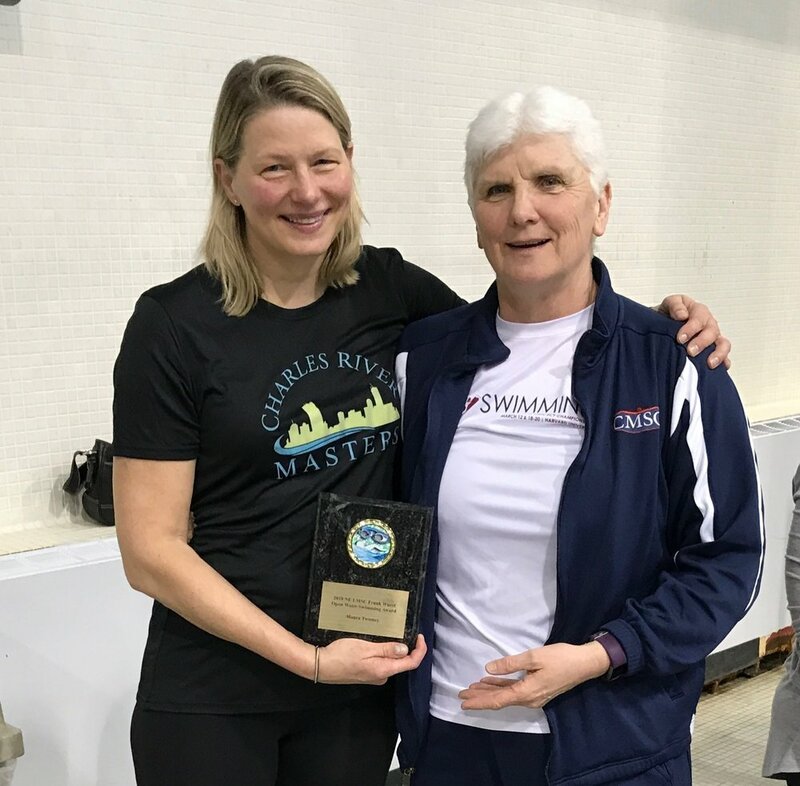 In recognition of his myriad contributions to our community, the USMS New England Local Masters Swimming Committee and Lyn Duncan are pleased to announce the creation of the Frank Wuest Open Water Swimming Award. The inaugural award will be presented between Distance Day events on Saturday, March 10th, 2018. View the award details and submit nominations here by March 11th, 2018. The awards will be presented during the NE LMSC SCY Championship Meet at Harvard on Saturday, March 17th. Thank you for your continued support of Masters Swimming. See you at the pool!